The Sonic the Hedgehog franchise has had its ups and downs, but in the fashion industry, he’ll always be an icon. The first time I saw a Sonic-branded face mask my first thought was, “why?” Isn’t Sonic kinda dorky? 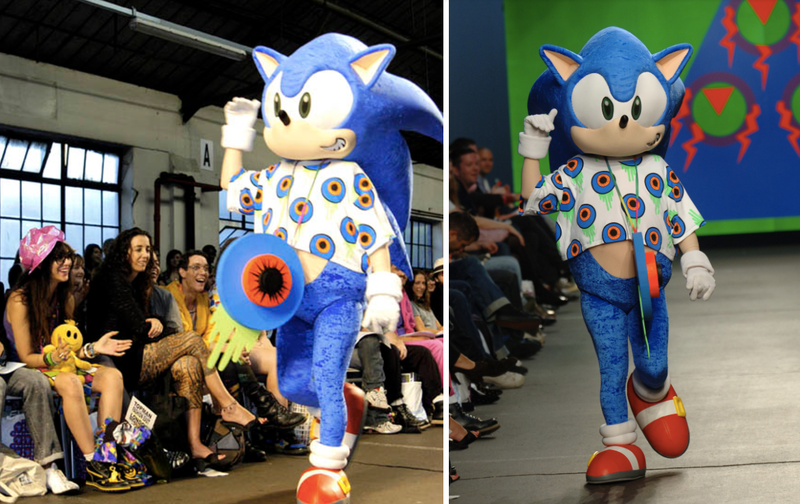 But not only has the fashion and beauty industry heralded Sonic over the years, he even walked a runway in 2007. This piece originally appeared 7/13/17. Carri Munden is a fashion designer who founded lifestyle brand Cassette Playa in 2006. She showed at London Fashion Week for 12 seasons. “I was interested in alternatives to catwalk,” Munden said over email. “My brand was built in and for a post internet generation, so both my designs and the way I communicated collections reflected that.” This meant augmented reality fashion shows, 3D printed props, and a touring purikura gif booth. Munden’s work is deeply intertwined with technology, and in 2007, that brought her to Sonic the Hedgehog. “For me Sonic is an iconic character—his character design and also his speed makes him one of the coolest gaming characters ever,” she said. While her 2007 show drew its inspiration from the famous Green Hill Zone, drawing direct reference from the the level’s color palette, and some of its glitched-out graphics. When Munden worked on the collection, she told me she was obsessed. “The digital prints were deliberately pixelated and were inspired by 8 bit and 16 bit gaming,” she said. “The geometric shapes and graphic outlines were also derived from retro games like Sonic.” She said she was only eating foods in green and blue packaging, and really felt like she was living inside the level as she worked. But that wasn’t enough for her. “I had created 3 giant cardboard monsters in collaboration with my friend, artist Gary Card, for the catwalk, but I didn’t want to make a Sonic the Hedgehog,” she told me. “I wanted to cast the real Sonic in the show.” Sega were very supportive of Munden, and Sonic the Hedgehog walked the catwalk in a graphic bleeding eyeball print tee. Munden said they had to custom tailor it to fit Sonic’s belly. Sonic’s appearances in fashion collections didn’t end with Munden, and in the past year he’s been becoming more and more popular. He’s on Glamglow products—they’re re-releasing their Gravitymud mask with art that includes Knuckles and Tails. Japanese sneaker brand Annipon released Sonic shoes that look like the character’s classic footwear. And last year, UK brand Drop Dead had an entire Sonic themed collection for the franchise’s anniversary. “I think for all of us it was such a fun project that let us relive our youth a bit,” Ben Normanton, one the graphic designers at Drop Dead. Almost all the staff had played Sonic growing up, but the team also did a lot of research into Sega’s archives to put their collection together. He said it was a fun project, and that working on something Sonic related let them relive their youth a little bit. The collection itself is steeped in ‘90s nostalgia. It has fuzzy sweaters, bucket hats, cute collared dresses, and all the items have a strong connection to Sonic and its design. Some of the items are more subtle—a orange sweater has Tails’s tails embroidered on the chest—and other are more overt. Normanton said that one of his favorite item was the “First Place,” bomber jacket, which has a saucy-looking Sonic embroidered on the back. But he also really wanted to see Sonic’s red and white sneakers in real life, so the collection has a pair of slippers based on them. Normanton sees Sonic as a unique character with a strong aesthetic that is still compelling after 25 years. Even if the people working on the collection didn’t play the Sonic games as kids, they still felt a connection to the character and the world he inhabits. In fact, Munden said that Sonic doesn’t just appeal to fashion designers, but to anyone in the design industry as a whole. Dropdead’s Sonic collection is emblazoned with the cartoony character designs of Sonic and his friends, using many of Sega’s old logos and character portraits—appealing to nostalgia, but also letting the strong character design take the forefront. Munden was attracted mainly to the greens and blues of Green Hill Zone, but also says that design elements from other Sonic levels show up in her work. She told me that she loves Sonic level Marble Zone for its fire and volcanos (“I designed a fire repeat print on silk that has been used over 3 different collections.”), and Scrap Brain Zone for the way it combines gothic castles and industrial futurism. Lightning and fire motifs show up in several different Cassette Playa collections, and even her design for the cover of M.I.A.’s first album, Kala, has the red and orange of an 8-bit fire. When you look at Sonic through the eyes of Munden and Dropdead’s collection, you see vibrant primary colors, familiar character design, and a specific sense of time and place. It could be your living room in the 90s. Even if there’s never another good Sonic game, he’ll always be cool enough to walk the runway.